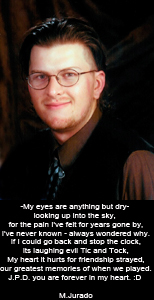 This web site is dedicated to the memory of my son, Jeffrey Dirlam. He passed away on August 30, 2002 at the young age of 25. He had Wilson's disease which is a rare, genetically inherited malfunction of the liver. It causes the liver to store excess amounts of copper until it becomes saturated and eventually, the accumulated copper starts to destroy the liver and also enters the eyes and the brain. If the brain is involved, the person with Wilson's disease will exhibit many possible presentations. Some of these include drooling, slurring of speech, problems with swallowing and problems with walking. In some instances, a person can also either manifest psychological problems with or without the other presentations. If the disease is detected early enough, tests can be performed to determine the extent of the damage if any. Then, the person simply goes on a maintenance therapy plan using some form of zinc, the most common and FDA approved is Galzin or zinc gluconate. If the person is in a more advanced stage, then he or she must start on a chelation therapy with either Trientine or Tetrathiomolybdate (TM) and the last choice would be the most popular but also the most dangerous of the three called Penicillamine. The reason Penicillamine is the most dangerous is because in approximately 50% of the patients who use this medication, their neurological condition worsens and does NOT improve over time. This can be devastating to the patient since a majority of patients seem to start showing symptoms in their late teens or early twenties when they are in the "prime of life." Jeff had severe neurological symptoms for the 9 months that he lived once we found out what was wrong with him. He could no longer eat or swallow (a PEG tube had to be placed in his abdomen for liquid feeding), walk (sometimes he could walk with the aid of a walker), talk or use his arms. In the last 3 months of his life, his mouth was frozen open the size of a baseball 24 hours per day, even when he slept. His mouth and throat had to be continually moistened with water and suctioned to prevent aspiration. He died while in a rehab hospital because of ignorance. His death was not from his disease, rather it was caused by Peritonitis and Septic shock, both of which were preventable with a trained and caring staff. But Jeff's life was not in vain. He had touched so many people's lives throughout the world during this journey, including my own, that he will never be forgotten. The legacy Jeff left for us was that his will was always so strong in the face of so much pain and suffering. He was more determined when he saw his family and friends' suffering, and he would not accept the ignorance and apparent uncaring attitude of many doctors in the HMO he was with. This web site is dedicated to that legacy. These pages will hopefully show a human being is all of his glory; a spirit with a smile always on his face, and willing to lend a helping hand to anyone who asked or looked like they needed a friend. This is the legacy my son Jeffrey left this world and it needs to be known and celebrated! I hope that the stories behind the pictures, his artwork and poetry will inspire all who experience it. Many of the friends in the Wilson's community, some of whom Jeff met and some who knew of his story and those who he inspired to keep fighting the ignorance, are also included in these pages. Jeff's life AND death are a testament to the incredible human spirit and to the higher power that exists in this universe! All content copyright 2003, 2009 by jeffslegacy.com. Duplication of images or context prohibited without express permission from the Administrator of this website. friends and guests have visited this site!